I planned to make these (favorite) cookies this weekend for the boyfriend, who is under the weather. But when I started mixing things together, I realized I didn’t exactly have all the ingredients. 1 c. walnuts, finely chopped, 1/2 c. raisins chocolate chunks FTW! Did you know what happens to cookies that don’t have enough flour? Nothing good, that’s what. They puddle out and don’t really get crispy. What’s the solution? Eat those suckers as fast as possible, of course! 1 The applesauce substitution wasn’t born of necessity – I usually swap half of the oil out for applesauce, but I usually don’t have only cinnamon applesauce on hand. I helped my mom with the sweet potato casserole yesterday (it was the most fun of the Thanksgiving projects: it involved smashing sweet potatoes and chopping up nuts with a new knife! ), and it ended up quite a lovely casserole, if I do say so myself. It also ended up a casserole with (despite us revising the recipe) almost unconscionable amounts of butter and sugar. You kind of know that going into Thanksgiving, though. I don’t think I had a green vegetable yesterday that wasn’t part of a casserole. And there was pie! 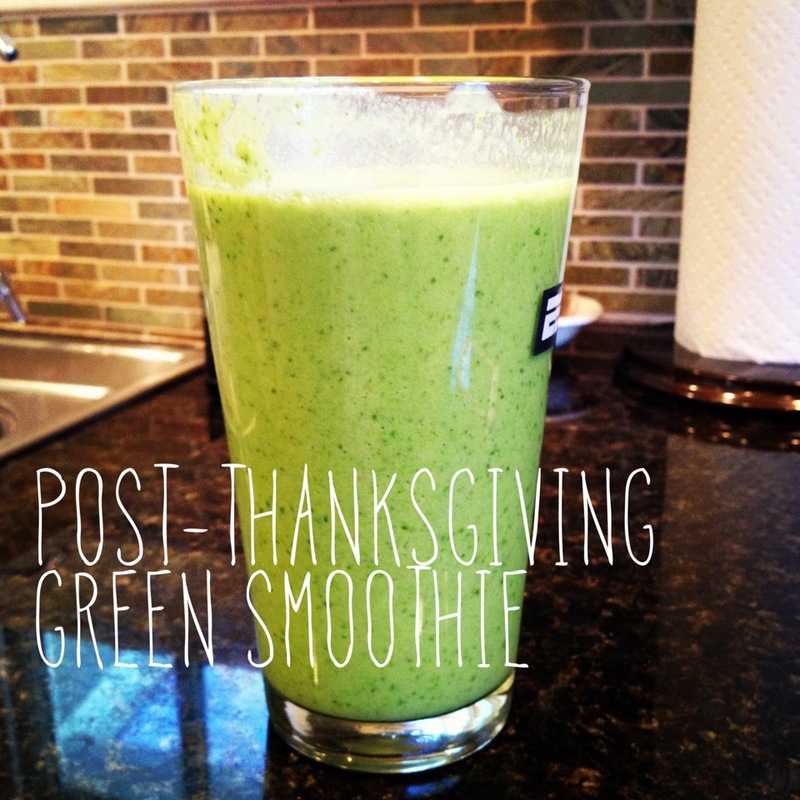 Accordingly, this morning I woke in desperate need of a green smoothie. I headed off to the grocery store for supplies, hoping I wouldn’t run into anyone I knew since I was sporting a greasy top-knot and wearing my pajama shirt with jeans. I grabbed some spinach, almond milk, almond butter, and bananas (and some chocolate bunnies because I am powerless to resist chocolate bunnies), and I was in business. We saw Tokyo 1955–1970: A New Avant-Garde, which opened to the public yesterday. It’s a collection of some interesting stuff, but the exhibit itself seems too cramped. Because so many of the pieces are so intense, I would have liked to see more white (or green, as the case may be) space between them – but pictures were stacked atop each other on the walls, and sculptures were crowded onto the same platform. Case in point: three separate sculptures/mixed media pieces are displayed on the same platform in such a way that we thought they were all part of the same work. What I consider to be a sloppy presentation aside, there are some interesting pieces there (including something described as molted human skin), and the exhibit is worth a view. 1 We did make a return trip to see the murals! While trudging through the snow during last week’s brief Nor’Easter, I remembered the igloo village I had seen on Pinterest, and I decided I would immediately go home and put up a Wanderlust Wednesday featuring that igloo village. Clearly, I didn’t do that. I went home and went to sleep instead. 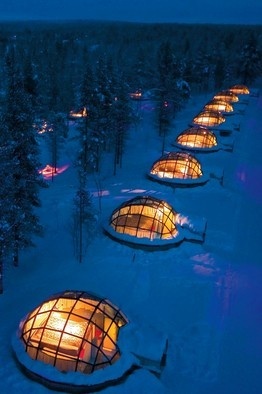 So please enjoy the igloo village for this week’s Wanderlust Wednesday! Doesn’t that look lovely? It’s the Hotel Kakslauttanen in Finland. They hand out woolen socks and they recommend drinking hot chocolate before bed. My last Wednesday would have been greatly improved if someone had handed me woolen sock and hot chocolate once I came inside from the Nor’Easter. At first glance, you might think that scaffolding surrounding the statue of Columbus in Columbus Circle means the statue is under restoration. Not so! 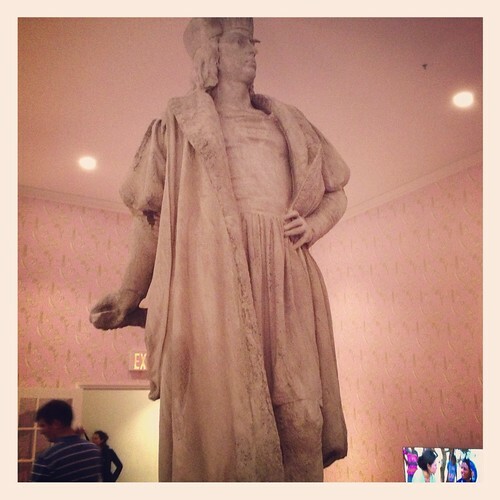 The statue is in fact the center of an art exhibit called Discovering Columbus. 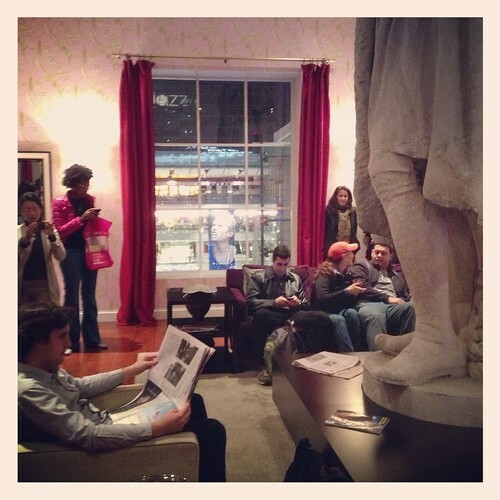 Just because the Columbus statue can’t fit into the chairs, though, doesn’t mean that you can’t – you’re encouraged to relax in the living room and read the magazines and newspapers (but not the books!). We visited a couple of weeks ago after work, and we found the experience really neat. It’s pretty crazy being so close to a statue that you usually see from so far away. Now, my fear of heights is well documented, and I’m sure you realize climbing the equivalent of six stories up some scaffolding was not really my cup of tea. Once up in the exhibit, I couldn’t quite ever get out of my head enough to totally enjoy myself – which is kind of a shame because the views were amazing, the exhibit is a neat idea, and every detail deserves attention, right down to the pink Americana wallpaper. Hey, the important part is that I got up there, right? And now I’m sharing it with you! Go visit! Last weekend, we (shamefully) ordered pizza. A while back, my brother had tipped us off on some Papa John’s contest/giveaway/something-or-other, and, long after we had forgotten entering, we received an email awarding us one free pizza. So last Saturday night, while I was stuck at home for work and neither of us felt like cooking, we cashed in our pizza. The delivery was backed up, and we live near the Papa John’s, so we walked to pick it up. On the way, we stumbled across Ganso, this new, trendy-looking Japanese place. Our neighborhood, while rapidly changing in character (hello there, new Armani Exchange store), is still not much of a scene. The restaurants near Ganso are the aforementioned Papa John’s, IHOP, and a nameless hot dog place. We were eager to try it, and so we returned this past Saturday night. We split an order of hijiki (if I had to choose a favorite sea vegetable, I would choose hijiki every time), and then each had a bowl of ramen: he had the short rib ramen, and I had spicy miso ramen with pork. 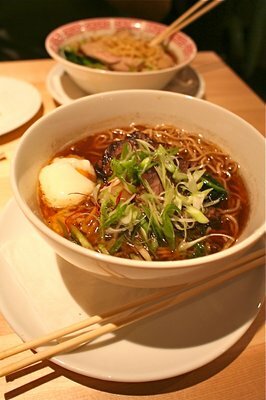 The bowls of ramen came out topped with attractive little piles of garnish – if I was the type of person who takes photos of her food, I would have taken a picture for you. As it was, I just ate my garnish. We were pretty excited to find this place not far from our home, particularly as the weather gets colder and it becomes soup season. Less pizza, more ramen!